Paul Larson Chello is the son of Paul W. Chello, P.M. of St. Albans Lodge No. 38, and Ellen M. Johnson Chello, P.W.M. of Olive Branch Chapter No. 87, O.E.S. He has a sister, Ellen J.C. McFarland. He graduated from Guilford High School in 1960. He received a B.A. in Biological Sciences from the Johns Hopkins University in 1964. In 1970, he received a Ph.D. in Pharmacology from the University of Vermont College of Medicine. His doctoral thesis involved a comparative biochemical study of enzymes from mammalian and parasitic tissue to develop new targets of chemotherapy for the treatment of parasitic infections. He received a J.D. from Quinnipiac College School of Law (formerly University of Bridgeport) in 1984. Paul married Emily M. Luckert in 1988 and is the father of Ashley Margaret Chello and the stepfather of Nicholas M. Kushner. They reside in Guilford, CT. He was an Assistant in Research (1965) and a Postdoctoral Fellow (1970-1973) at the Yale University School of Medicine, Department of Pharmacology, developing chemotherapy for the treatment of leukemia. From 1974 to 1980 he was a Molecular Pharmacologist on the staff of the Memorial Sloane Kettering Cancer Center and a Professor of Pharmacology in the Department of Pharmacology of the Cornell University School of Medical Sciences. While in the field of cancer research, he published over 60 papers and abstracts in national and international scientific journals. In 1980 he made a career change to the Practice of Law. As co-owner of the Chello Oyster House in Guilford, Connecticut from 1978-1987, he attended Law School simultaneously with working at the restaurant. Following graduation from Law School, he clerked for the Superior Court of the State of Connecticut and was a principal in Chello and Sokolowski, Attorneys at Law, in Stamford, Connecticut. Following the death of his partner, Myron Sokolowski, he joined the firm of Antollino, Angelo and Scalesse, Attorneys at Law in Branford, Connecticut, with whom he practiced for several years. He now practices as a sole practitioner with offices in East Haven and in Guilford. His professional memberships, past and present, include the American Association for Cancer Research, the New York Academy of Sciences, the American Society for Pharmacology and Experimental Therapeutics, Sigma Xi, the American Society for Cell Biology, the American Bar Association, the Connecticut Bar Association and the New Haven County Bar Association. He has been honored with the following awards: United States Public Health Service Predoctoral And Postdoctoral Fellow; National Defense Educational Act Title IV Fellow, and the Outstanding Legal Scholarship Award from the University of Bridgeport School of Law. He is active in his community. He has served on the Board of Directors of the Guilford Free Library and as a Commissioner for the Town of Guilford on the Economic Development Commission, the Land Acquisition Commission, on two Charter Revision Commissions and on the Rollwood Farm Advisory Commission. He is currently serving as one of five Commissioners which constitute the Guilford Board of Police Commissioners and as one of five members of the Guilford Board of Ethics. He is the Administrative Hearing Officer for Zoning Enforcement and Inland Wetlands violations for the Town of Guilford; and, often is the Moderator for Guilford Town Meetings. He is a long serving member and past Chairman of the Guilford Republican Town Committee. He is currently its Treasurer. He is a member of the First Congregational Church of Guilford. He was Raised in St. Albans Lodge No. 38, AF&AM in 1964, and served as Worshipful Master in 1974 and in 1995, earning the Master's Achievement Award in both years. He is President of the Board of Directors of the Guilford Temple Association, a position he has held for several years. He is a past President of the Fourth Masonic District Blue Lodge Council. He is a Charter member of the newly formed "colonial concept" lodge, Quinta Essentia 500. He served as the Judge Advocate for the Most Worshipful Grand Lodge, A F & A M of Connecticut for three terms and also served on the Legal Affairs Committee. He was Exalted in Halleck Chapter No. 44, RAM in 1971, and served as its Most Excellent High Priest in 1976, 1986, 1991, 1994, 1999, 2000 and 2009. In intervening years he held subordinate offices. He was consecrated in the Order of High Priesthood in 1976. He was appointed Grand Custodian of the Grand Chapter of Royal Arch Masons of Connecticut in 2000 by Most Excellent Grand High Priest William L. Greene. He was appointed to the Grand Line of the Grand Chapter of Royal Arch Masons of Connecticut as Grand Master of the Third Veil in 2004 by Most Excellent Grand High Priest Robert G. Fitzgerald, and progressed to election in 2010 as its Most Excellent Grand High Priest. He now serves as a Grand Trustee. 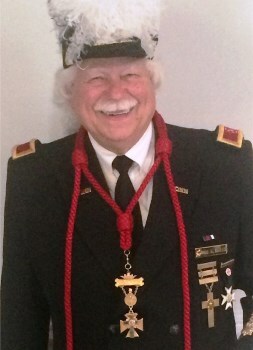 He has served as the Ambassador of the General Grand Chapter International to Connecticut and is a recipient of the General Grand Chapter Ritual Award. In 2011, he was appointed by Most Excellent General Grand High Priest, Edmund "Ted" Harrison to the Board of Directors of its Royal Arch Research Assistance charity. In 2013, he received the General Grand Chapter Medal in Bronze for distinguished Masonic service. He was Received and Greeted in Crawford Council No. 19, R&SM in 1972, and was elected Thrice Illustrious Master in 1980. He received the Thrice Illustrious Master Degree (Order of the Silver Trowel) in 1980. He is also a Charter member of Menunketuck Council No. 36, R&SM and served as its Thrice Illustrious Master in 1992, 1993, 2001, 2002, 2005, 2006, 2008 and 2010. In other years he served in subordinate offices. He was appointed to the Grand Line of the Most Puissant Grand Council of Royal and Select Masters of Connecticut in 1996 by Most Puissant Grand Master Richard L. Small, and progressed to election in 2000 as its Most Puissant Grand Master. He now serves as Grand Trustee and as the Grand Representative of Ohio near Connecticut. He was honored as a Knight of Ish Sodi in 1995. He is past Thrice Illustrious King of the Connecticut Council of Anointed Kings (Order of the Silver Trowel) and portrays the role of Adonijah in the degree. He was knighted in New Haven Commandery No. 2, KT in 1972, served as Eminent Commander in 2006, and is now its Treasurer. He is the Grand Representative to Ohio near Connecticut. He received the Order of Knight Crusaders of the Cross in 2006. He is a member of Apostles Tabernacle No. XXVII, Holy Royal Arch Knight Templar Priests and has served as its Eminently Distinguished Preceptor. In 2010 he was appointed to the Grand Line of the Grand Commandery of Knights Templar of the State of Connecticut by Right Eminent Grand Commander Jack H. Stevens. He will serve as the Right Eminent Grand Commander for 2018-2019. He is a Companion Knight and Past Governor of the Connecticut York Rite College No. 17. He received the Order of the Purple Cross of York in 2007 and was created an Associate Regent of the York Rite Sovereign College of North America. He was installed as the Right Eminently Distinguished Grand Governor for Connecticut of the York Rite Sovereign College of North America in July, 2010. He is a Brother and Past Sovereign Master of Nathan Hale Council No. 78, Allied Masonic Degrees. He was created and constituted a Knight Commander of the Red Branch of Eri and Appendant Orders. He is a Frater (VIII?) of Connecticut College, Societas Rosicruciana in Civitatibus Foederatis, and served as its Celebrant for several years. He is a Knight Companion of St. Andrews Conclave, Red Cross of Constantine and Appendent Orders and has served as its Puissant Sovereign. He is a member and past Prior of Connecticut Priory No. 28, Knights of the York Cross of Honor. He is entitled to wear the Knight of York Grand Cross of Honor with two quadrants. He is a Knight of Saint Thomas of Acon, Novum Eboracum Chapel No. 51, and is a Charter Member of Nutmeg Chapel No. 29. He is a member of the Royal Order of Scotland. An active member of the Scottish Rite Bodies and Lafayette Consistory in the Valley of New Haven, he was the Thrice Potent Master of the E.G. Storer Lodge of Perfection for two terms (2007-2008), and was Most Wise Master of the New Haven Chapter Rose Croix for six terms (2010-2016). He was the Senior Warden of the Elm City Council, Princes of Jerusalem and is the Second Lieutenant Commander of Lafayette Consistory. He was created a Sovereign Grand Inspector General, 33Degreee, Northern Masonic Jurisdiction on August 26, 2008. He is a Noble of Sphinx Temple, A.A.O.N.M.S. and a member of the Order of Easter Star. He served as a member of the Board of Directors of the Masonicare Healthcare Center and Ashlar Village of Newtown, and as a member of the Board of Directors of Masonicare Home Health and Hospice. He is a member and past president of the Dusis Society, a member and past president of the Twilight Club and a past president of the York Rite Coordinating Committee.